The Ostrich is known as the bringer of vision and dreams; a symbol of awakenings, positivity, femininity, empowerment and authenticity. All values which are central to the Elliot & Ostrich philosophy. Contrary to Western saying, according to African symbolism, an Ostrich puts its head in the sand not to escape danger but to remain grounded in the occurrence of danger. For Jennifer the Ostrich is also the symbol of Africa: the Motherland, her roots and the place where she feels truly grounded & creative. Elliot & Ostrich wants to inspire you to stay true to who you are. To take a step back and celebrate meaningful moments, whether it is a moment of love or a moment of career success, with a timeless piece of jewellery. The question is not so much “who is Ostrich”, it is rather “who are you”? Because the most beautiful thing about a gift is the person who gave it & the reason why. Each piece can be engraved with a personal message as a reminder of a special person or meaningful moment. All pieces can be produced in white, yellow or yosé gold (our custom gold alloy) depending on your skin-tone or preference. Some pieces offer customization of gemstone shapes and colours. All pieces are specifically designed to be stacked together, to tell your story. For brides who want to tell their story. Elliot & Ostrich offers a Bespoke solitaire & wedding band service to those who are looking to celebrate a special milestone with a piece which is truly one of a kind. The wonderful thing about real jewellery is that it is the only gift which touches the heart and can be worn close to it every day for the rest of your life. Each piece is handcrafted, in 18 karat gold, upon order, by Antwerp’s most skilled craftsmen. Our jewellery is made with love and utmost attention to detail. 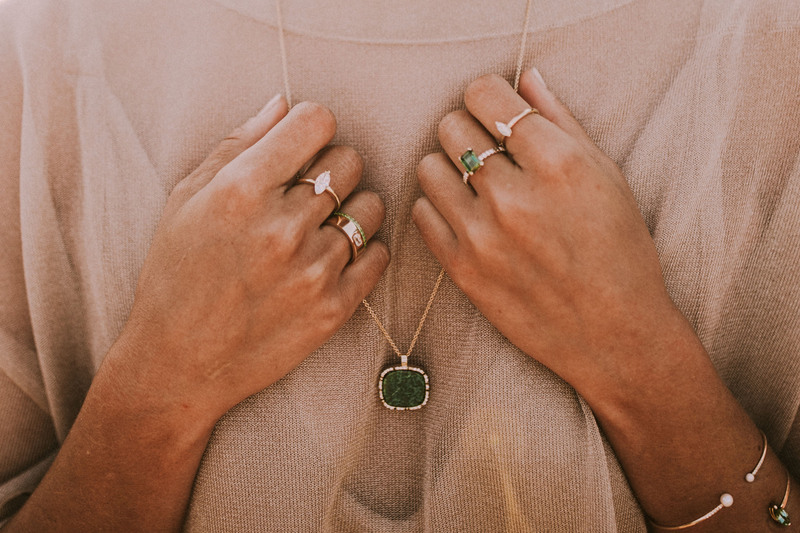 Graduate gemologist Jennifer Elliot personally selects the gemstones which fit her signature A quality standard. If you are looking for the perfect engagement ring without the stress and with a guarantee for quality, I can certainly recommend Jennifer. She offers a personalized service contrary to the regular jeweler. She involves you in every step of the process – a fantastic experience which makes proposing even more personal. In June 2017 I graduated as a Yoga Teacher. Completing this course had cost me, quite literally, blood, sweat and tears. Next to that I was also celebrating the second anniversary of my own yoga wear label, Yoga By Julz. So, these events called for a little gift from me to me. I wanted something to remind me of my journey, something to keep my intentions close to me, something to celebrate this precious moment. So, Jennifer created this beautiful ring for me. Still so happy with it, every time I look at it I smile and remember the intention I hold most dear: if you can dream it, you can do it. Jennifer created a little gem for me as a Bespoke wedding anniversary present. As her own worst critic, Jennifer will only rest when the result is 100% according to the client’s taste. She has impeccable taste, so I never lost confidence during the process.